Decidedly different from your everyday fare, our wonderful breakfasts always feature fresh, Sonoma-harvest ingredients. Our savory morning meals will delight your senses and awaken your taste buds. Oh, and since we know once you’ve sampled our food, you’ll ask — here are our most popular recipes. Our Wine Cellar dining room, featuring an oversized stone hearth, provides the setting for an unforgettable morning culinary experience. Your Inn at Occidental breakfast begins with our custom-blended coffee, your choice of juice, a fresh-baked pastry, two types of house granola, and locally harvested fruit. Each day surprises with a different hot entrée that delights the senses, possibly Pecan Caramel French Toast, or Eggs Benedict, or Orange Cream Stuffed French Toast, or perhaps something else a little unexpected. 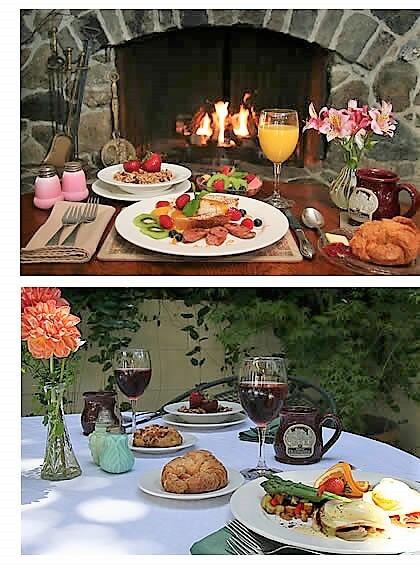 Using herbs from the inn’s gardens and the choicest fruits and vegetables from Sonoma’s best farms, our chef prepares elegant and hearty breakfasts that will leave you satisfied and ready to explore the charms of Sonoma County. Here are our most popular breakfast recipes — each serving six. We add new recipes regularly, so when you’ve mastered these, check back for more. Polenta Crusted Quiche with Leeks and Bacon — A wonderful breakfast treat that’s perfect for company, as you can assemble it the night before, and bake it off in the morning. Creamy Polenta with Fruit Compote — Dressed with fruit, polenta never tasted so good. Homemade Granola — Our famous homemade granola can go home with you! Potato Torta — This hearty potato dish works for breakfast or lunch. Don’t feel like cooking? Come stay with us!